It’s an old question, but still a good one: If God were to command you to do something evil, would you obey? Some people are convinced otherwise. Let’s remember what happened just last week. 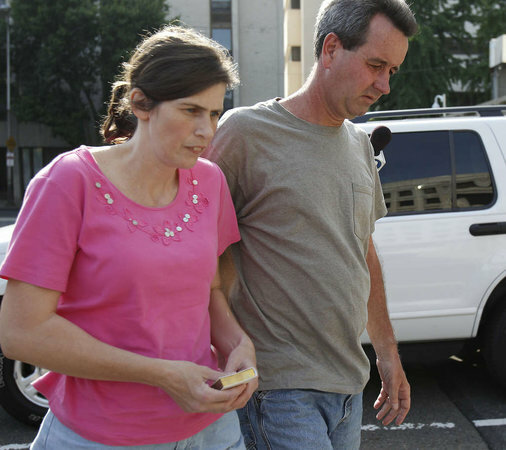 Herbert and Catherine Schaible, a couple in my home state of Pennsylvania, were sentenced to prison because they had refused medical care for their 8-month-old son, Brandon, who then died. “We believe in divine healing, that Jesus shed blood for our healing and that he died on the cross to break the devil’s power,” the boy’s father had said. The kicker is, he didn’t say that about Brandon. He said it last year after another one of their children had just died in similar circumstances! The Schaibles were sincerely convinced that The Right Thing to Do was to pray for their son and entrust him to Jesus, the Great Physician. They had dozens of Bible verses to prove it. They were so convinced that they did it a second time, even after an epic fail the first time. What could the Schaibles have been thinking?? I have a pretty good idea. You’re no doubt familiar with the story of Abraham and Isaac. God demanded of Abraham that he sacrifice his son, Isaac, as a burnt offering. Although God had promised to give Abraham many descendants through Isaac, Abraham was willing to obey God and kill his son. Only an angel’s intervention at the last moment kept the knife from plunging into Isaac’s heart. So what was Abraham thinking?? The Bible actually tells us, and it’s very simple. Hebrews 11:17-19 says that Abraham believed that God would raise Isaac from the dead. For his tremendous faith, Abraham makes it into the Faith Hall of Fame, as the catalog of believers in Hebrews 11 is sometimes called. This man who was willing to kill his own son and trust God for the outcome is upheld as an example for us all. I don’t know whether the episode of Abraham and Isaac actually happened, but the Schaibles’ did, and theirs is very much in the faith-filled spirit of Abraham. This is the problem with faith-based morality. The more divorced from reality it is, the higher it is exalted. The prologue to the Faith Hall of Fame says that faith is “assurance about what we do not see.” In other words, it is being sure of something without evidence. The more sure you are, based on as little evidence as possible, the better. By design, faith-based anything (morality or anything else) has no check based on observable outcomes. To the extent that there are checks, we are not talking about faith, but about its opposite, namely skepticism. Returning to the question at the top of the post, the Bible-follower must answer, “Yes, I would do something evil if God told me to” and he could not claim that such things don’t happen. Most of us never hear God’s voice telling us to kill our children. But how about simply hating on people? Another item in last week’s news was the Arizona legislature passing a bill that would allow businesses to refuse service to homosexuals, if the business-owners had religious objections. You can guess which way the lawmakers on the Religious Right voted. All but three Republicans voted for the bill; all the Democrats voted against it. This is faith-based morality at work. As I’ve started to outline in the last two posts, there is an alternative: morality based on the well-being of conscious creatures. I contend that this is a safer bet. Of course, secular morality runs the risk of missing what may only be observable through the “eyes of faith.” I’ve addressed that in my post, Spiritual Discernment, but I’ll say more next time. When I was in high school, my grandparents took me on a trip to the American Southwest to attend a Quaker retreat. (These were the same long-suffering grandparents who took me to the eclipse that I missed while standing right under it.) I remember them asking what I thought of medical missionaries like Albert Schweitzer, who devoted his life to relieving the suffering of the poor. A particularly obnoxious evangelical at the time, I answered that any missionary who merely did “good works” but did not concern himself with the saving of souls was wasting his time. To me, good works did not even count unless performed in the context of glorifying God or leading people to him. And then there’s the matter of motive. I recall learning at the summer camp where I became a Christian that even our good works are actually selfish, for our motive is to make ourselves feel good. My earlier views embarrass me now, but at least I got one thing right: moral truths really do exist. I remain convinced of this even though I have cut the line to the Christian faith that was once my anchor. Why do I still believe in right and wrong? If morality is not grounded in glorifying God, how can it objectively exist? In The Moral Landscape, Sam Harris invites us to imagine two lives: a Bad one endured by a refugee of guerrilla war in Africa whose husband and children have been hacked to death by machetes; and a Good one enjoyed in the midst of loving family, rewarding work, and excellent health. Surely, he argues, someone who seeks to move as many people as possible from the Bad Life to the Good is on a better moral track than someone who seeks to immiserate all and sundry. And since what makes a life Good or Bad is nothing more nor less than the brain state of the person living it, and brain state is a physical fact about the world, we can see that morality is ultimately anchored in hard facts. Moral facts are exactly as real as facts about our blood pressure or oxytocin levels. There are many possible objections to this argument, and I’ll consider some in upcoming posts. For now, I’ll illustrate with what Dr. Harris would say to a hard-core evangelical like my former self. A theist, he says, merely expands the notion of brain-state to include God’s brain. Thus, moral realism continues to be grounded on the brain-states of conscious beings. One can do similar jiu jitsu to accommodate an afterlife: simply expand the time-span for measuring brain state. Having subscribed to both secular and religious morality at different times in my life, I confess that I find Dr. Harris’s attempts to reconcile them to be slightly artificial. Although including God’s brain-state and an eternal time-frame in one’s considerations may reconcile the approaches in theory, the theist’s tools for learning about the unseen are so different from the ways we learn about each other here on Earth, that they feel like completely different systems in practice. Maybe that will be a good place to begin the next post: contrasting faith-based morality with morality based on elevating the well-being of conscious, mortal creatures. In the meantime, how about you? Do you believe that moral facts are just as real as physical ones? Do you buy Sam Harris’s argument that they are related? I almost didn’t read Sam Harris’s book, The Moral Landscape, because I could not imagine it had anything worthwhile to say. The book gets its title from the idea that various moral viewpoints are like different locations on a landscape. Moral systems that are associated with greater well-being are the higher elevations; those that bring misery are the valleys. For example, the moral system that characterizes a typical, first-world democracy, while not perfect, is certainly at a higher elevation than the brand of morality to which the Taliban would subjugate us all. Our job, says Harris, is to get to the highest ground possible. I’ve always been skeptical of utilitarianism — the idea of “the greatest good for the greatest number.” First of all, how do you establish what is “good”? And even if you can measure the good that someone experiences, how do you combine those measurements across several billion people to produce a meaningful statistic that lets you make a moral decision? And let’s not even talk about the conundrums exposed by trolley problems! Before reading his book, I thought Dr. Harris’s idea had to be just another cul-de-sac in the utilitarian suburb. My own view, which I outlined last fall, is that humanity’s competing moral systems are nothing more than memes, but, happily, the memes that cause their adherents to flourish will eventually dominate. Moral values must ultimately be about the well-being of conscious organisms (including God, if you will). If there were a value that had absolutely no impact on anyone’s consciousness, we would by definition have no reason to value it. One’s well-being is embodied in one’s brain state. We have thus made a link between morality and physical fact. Physical facts are the domain of science. Science can therefore help us find moral truths. The Bad Life versus the Good Life. The disastrous consequences of separating facts and values, as practiced by the Left. Ditto, when done by the Right. An analogy between moral health and physical health. How much respect should we give other views? Have we flown the perch built by evolution? How does an afterlife figure in all this? How a barbarous act by one person becomes respected if it is a cultural practice. Might there be more than one answer? The strange case of the Dobu Islanders. If we were to concern ourselves with maximizing well-being rather than with right and wrong, what would we lose? The most important task facing humanity in the twenty-first century. There’s actually a lot more, but that’s all I’ll promise for now. Stay tuned!